I’m getting back in the swing of things after a 10 day stay in the hospital for an obstructed intestine, apparently caused by scar tissue in my abdomen from the previous cancer surgery. Lent is often a time of fasting, and I had to go the first 7 days with no solid foods at all to help the system relax and clear itself out. When I finally got to eat some chicken broth, it tasted finer and richer than Thanksgiving dinner! I had good care in our local hospital and thank all the nurses and doctors who looked after me. Being close by also had the advantage of a steady stream of visitors. Staff dropped by to inquire, pray and support. One of our 2nd graders, Kyla, had to come up to the clinic for tests, and she stopped by the room with a homemade card and hug that brightened my day considerably. LaToya, one of our high school juniors who works an after school job at the hospital brought me my tray of food and greetings from the Crane Home. As I roamed the hallways, pushing IV pole ahead of me to get some exercise, I ran into a whole variety of folks from the community with health concerns of their own, and tried to be a caring listener to them. Hospital stays trigger so many different moods and emotions. At times during the week I felt anxious. Once they determined I wouldn’t need to have surgery, but just wait it out, boredom became a struggle. A few times the hospitalization had a retreat-like quality, as I had plenty of time for prayer and spiritual reading. With no meals to break up the day, the Divine Office, with its various prayers at each time of the day, took on greater significance to mark and celebrate the passage of time. I tried to listen carefully to what God might be saying in the midst of sickness and struggle. Being active, it’s hard to slow down and my mind raced with the many things I could be doing. Now that I’m home and have both the freedom and opportunity, I don’t have the energy I’d like. It’s important to pace yourself and not overdo it. Only one other staff member was in the office all day, and I took advantage to work on several project uninterrupted. I gave several hours to answering Christmas cards. I answer cards as they come in, so some friends and relatives won’t hear from me until after Christmas, but I figure you’ve got twelve days to celebrate anyway, right? With each note, I say a little prayer and remember people with nostalgia. I wish time and distance didn’t separate us so much from all the people who have made such a difference in our lives. I wish we were more connected, but I believe we will be in God’s greater plan. As the Lakota (Sioux) say – Mitakuye Oyasin – We are all relatives and I’m grateful for all those I share this path of life with. I arrived home from Mayo after two days of tests and consultations. On the cancer front, everything looks good. I don’t need any more treatments for now. I arrived home from the hospital after two days of tests and consultations. On the cancer front, everything looks good. I don’t need any more treatments for now, and I’ll just go on their regular 3 month checkup interval for this first year. They were very pleased with how the incision is healing up, and how things look inside after the surgery. They think they were able to get all the cancer. The nerves in my foot are still in a lot of pain. The doctor said that will take a while to heal, several months or even as long as a year … you just never know with the nerves. I’m on some pain meds to manage that, but the down side is the medication make me sleepy. The doctor said I can start pushing myself – doing a little more exercise and activity every day – and try to get back to a normal routine. But, I still may need more rest for a while and have to pay attention to my body. The nerves in my right leg and foot are very sore and sensitive, which makes it hard to walk or stand for very long. I’m starting to get out and about a bit, even if only for a couple of hours. The nerves in my right leg and foot are very sore and sensitive, which makes it hard to walk or stand for very long. But, that’s what the doctors expected after the surgery. With time, they also expect the pain to diminish. In the morning, I dropped by the business office to see folks. I’ve been back on campus for some 10 days now, yet there are so many folks I haven’t seen, so I did a lot of catching up. Our summer day camps are in full swing, and I stopped by the dining hall for lunch. For these next two weeks, the camp is for children from Lower Brule. They ride our bus in each day for arts and crafts, cultural activities, recreation and a couple of good square meals. Several of the children are St. Joseph’s students, so I got lots of hugs as I worked my way through the tables. In between activities, I took a few naps and didn’t do a whole lot else. I’m still very tired and pay attention to my body when it needs rest. I’m learning to cope with the limitations. A simple task like getting dressed takes lots of extra time and effort, especially putting on my socks. The first time I was back in chapel I genuflected out of habit but found it very difficult to get back up without the pew to lean on. My foot doesn’t work so well on the brake or gas pedal of the car, so I’m grounded for now. Yet, I count my blessings every day, grateful they found the cancer in time to successfully remove it. This healing time just takes patience and time. Fr. Steve’s recovery continues slowly but surely; right now, the need for sleep and rest is great. Fr. Steve’s recovery continues slowly but surely; right now, the need for sleep and rest is great. All the prayers and concern friends continue to shower upon Fr. 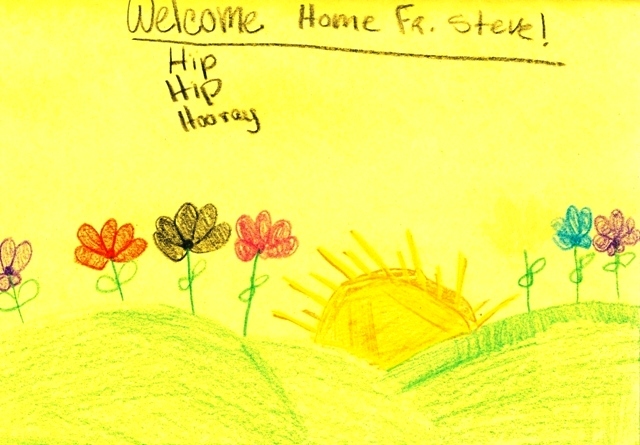 Steve are deeply appreciated; we all look forward to his full recovery! After a doctor visit this morning, blood tests show Fr. Steve is stabilizing. Of course, this is wonderful news. Of course, lately, our weather has also ensured there’s rarely a dry moment! Here’s to a wonderful week and continued progress on many levels. Fr. Steve arrived home Friday evening (June 4), and the folks at school had two placards – complete with balloons and ribbons – welcoming me back to campus. Thanks to Fr. Bill for keeping everyone posted while I was in the hospital! I arrived home Friday evening (June 4), and the folks at school had two placards – complete with balloons and ribbons – welcoming me back to campus. One sign was posted at the first stop sign on campus, and the other was at our house. When we stopped to take a picture, 7th grader Erin was walking by the Rec Center and came up and gave me a big hug. It is so good to be back. My main ailment right now is my right leg. The nerves are very sore and sensitive after the surgery. The doctors are hopeful the pain will diminish and I’ll get a little stronger each day. I just know I’m not going to be kicking soccer balls or field goals any time soon. I get around very slowly, but I am able to get around. I woke up last night and had some discomfort. I went to find the nurse call button and realized I was home in my own bed and just had to manage myself. During my 11 days in the hospital I received wonderful care, but it is still a bit disorienting. One of the hospital chaplains pointed out that we talk a lot about “One day at a time” but when you are seriously ill, you really have to live it. Last night, I went to supper at the Sheehy Home and caught up on the activities of our eighth grade boys who are now spending three weeks in extra classes as they transition into the high school program. Nate grilled pork chops outside, and I at the biggest meal I’ve had in two weeks. It’s a good sign that my appetite is coming back. Fr. Anthony and I celebrated mass in the house chapel. It’s still hard to stand for long periods of time, and I have to build up to it. This afternoon, I went to the office just to work on thank you cards. So many people have offered support and inspiration and helped see me through this rough period.